The smoke has cleared and I’m excited to share my latest cooking adventure! Over the last two summers I did a fair amount of smoking using my gas grill rigged up with a smoker box and water pans. This year, I tackled smoking in a dedicated smoker! Last November I was lucky enough to win a Masterbuilt electric smoker and I finally put it to work. I know it’s not a traditional smoker that you’d see at a real barbecue place – but for a novice smoker in the ‘burbs it is perfect. The electric smoker maintains a consistent temperature and all it takes is some woodchip additions and monitoring throughout the cooking process. With inspiration from my previous smoking adventures and my brother’s smoking expertise I put together a menu for a recent get together. When I entertain, I love to try out new recipes, new dishes, and new cooking methods. The challenge of trying something new is exhilarating! There are one or two items that always make an appearance on the table, but most of the dishes are new. I tackled menu planning and party planning by starting with a list. First with a list of all of the dishes and their ingredients and second a timeline for when each dish would be made. A little cookbook, online research, and a phone call to my brother helped to put the finishing touches on the smoking timeline. The next step was to make labels for each dish for the serving table. This helps plan the table space and also ensures that dishes don’t get forgotten in the rush to get everything on the table. There are too many delicious things to cover in one post, so I’ll start today with the smoked meats and barbecue sauce. I decided to smoke an assortment of items to test out my new toy. I picked my favorite meat to cook – brisket. Using the temperature required for the brisket, I adjusted the cooking times for the rest of the items. The smoker has different shelves which allowed me to easily add each item at the appropriate time. 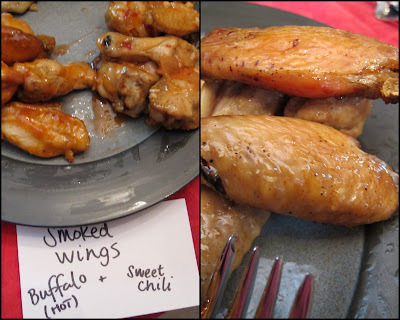 Everything turned out flavorful, but my hands down favorites were the chicken wings and the chicken breasts. The meat was juicy and the smoky flavor infused each bite. 2: Buffalo – I received a free bottle of KC Masterpiece hot buffalo sauce through Foodbuzz. Since I’m not a fan of buffalo flavoring it was a perfect addition to the party. I tossed of the cooked wings in the sauce and every reported that they loved the flavor and spice. 3: Sweet Chili – this sauce, made by the folks behind Want’ems chips is inspired by duck sauce. I was given the sauce to sample. The dip/sauce is full of onion, pepper, garlic, and jalapeno pepper. I tossed wings in a generous helping of sauce. They were sweet, with just a little kick. My coworkers traveled to India earlier this year and brought back an assortment of spices for me to add to my pantry. I thought this was the perfect opportunity to try them out! Garam masala is a spice blend that is made a little different by each person. It often has cardamom, cinnamon, ginger, coriander, nutmeg, and cloves. Those are all spices that go well with poultry. I rubbed each chicken breast generously with garam masala – making slits in the skin and putting the spices underneath the skin as well. Let the seasoned chicken rest in the refrigerator for an hour or so. Rub the chicken breasts with olive oil before adding to the smoker. When the internal temperature reaches 160 degrees, remove from the smoker and let rest for 20 minutes before cutting and serving. Serve with barbecue sauce. Eat it on its own or make a messy sandwich. Smoking time: About 6-7 hours for this size. After 4 hours wrap brisket in foil and continue to smoke for another 2-3 hours. The internal temperature should reach 185 degrees. Seasoning: Coffee Dry Rub. I first made this seasoning two years ago when I smoked my first ribs. The combination of coffee, brown sugar and chili powder gives the meat a great flavor. 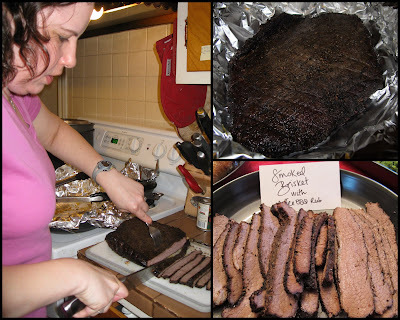 Serving: Let the brisket rest for at least 20 minutes before thinly slicing. Serve plain, douse in barbecue sauce or make a sandwich! Reheat the next day in barbecue sauce. Barbecue sauce is really easy to make. If you have an extra 20 minutes, it’s well worth whipping up your own unique sauce. I wanted to incorporate the garam masala to pair with the chicken flavoring. I did some internet searching to find a recipe to consult for proportions of ingredients. I happened upon a Barefoot Contessa recipe for a basic barbecue sauce. Using the recipe as a starting place, I created my homemade sauce. Makes approximately 1 quart of sauce. Store in an airtight container in the refrigerator if there is any sauce leftover. That's all for this post. Stay tuned for the next installment with appetizers and a giveaway! The Want'ems chips and dips were provided to me as a free sample. I was not obligated to review and I did not receive any financial compensation. I received the KC Masterpiece Buffalo sauce through the FoodBuzz tastemakers program. The sample was also complementary and all thoughts about it are shared voluntarily. The rest of the food I bought at the farmers market and grocery store! That is quite the impressive spread! Nice recap of the day! Wow, your guests were definitely treated to a feast! Everything looks phenomenal! For more information about the All natural Want'ems products used in this fantastic meal. Follow @wantems1 on twitter or visit our website www.wantems.com. This is awesome! I just use my little baby stovetop smoker most of the time. This is quite the undertaking. That was quite a feast! The brisket looks amazing, I love a good coffee rub! I've never used a smoker before, it kind of intimidates me, but maybe I need to get over myself. :) If I come to Boston in the fall, I demand a BBQ in my honour with a buffet of smoked goods! Ha, ha, ha.